Two-thirds of consumers in the United States say they now primarily research their vacations online, and 65% begin searching for information on the Web before deciding on exactly where they’ll be heading. Moreover, once they start looking at online content related to a trip, potential travelers dive in deeply and often. An analysis by Expedia found consumers visit 38 different websites, on average, in the 45 days before booking travel. In other words, digital content increasingly influences every decision that travelers make. So, how can your brand create content that engages deeply and compels action? 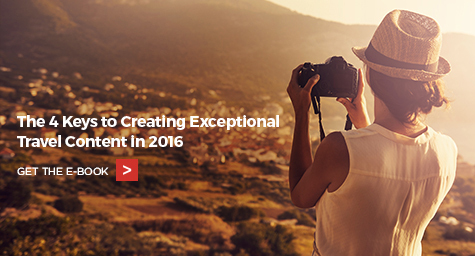 The new e-book from MDG Advertising, “The 4 Keys to Creating Exceptional Travel Content in 2016,” explores a few key things every organization should do to boost the impact of the pieces it’s creating. The complimentary e-book is based on findings from a set of recent independent research reports. Visual content: Providing compelling photos and videos has become essential for travel brands; find out what consumers are looking for and how to develop pieces efficiently. Mobile-first development: Smartphones and tablets have become the primary devices for engaging with travel content; learn how your brand can embrace this shift. The buyer journey: Travelers now consume a wide range of digital content while planning and booking trips; explore the best way to create pieces for each stage. Multi-platform content: Consumers don’t just consume travel content on company-owned channels; discover how to engage across multiple platforms. Check out the full e-book for in-depth exploration of how each of these approaches can help your travel brand achieve content marketing success. Create digital content that goes further in reaching travelers. You’ve just moved closer to reaching the 66% of travelers who primarily research online before booking. With the simple tips revealed in this complimentary e-book, you’ll be well on your way to creating content that turns travel searches into travel bookings. Implement a successful travel content marketing strategy today. Contact MDG Advertising at 561-338-7797. MDG Advertising is a full-service advertising agency and one of Florida’s top travel marketing firms. With offices in Boca Raton and New York City, MDG’s core capabilities include branding, logo design, print advertising, digital marketing, mobile marketing, email marketing, media planning and buying, TV and radio, outdoor advertising, newspaper, video marketing, website design and development, content marketing, mobile marketing, social media marketing, and SEO. To discover the latest trends in travel and hotel marketing, contact MDG Advertising today at 561-338-7797.